I have a never used Hoveround Power Chair Scooter for Sale. I am unable to use one of these scooters inside my house as my rental home is inaccessible to power chairs of this type. The Hoverround is now 4 months old and has never been used.
. 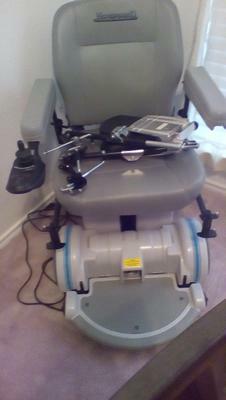 The unused power chair comes with leg extenders and with a very nice discount price. If you are familiar with Hoveround scooters then you know that they have a very good reputation and when you see it you can ask questions or send them to me using the form below provided by GoGoCycles Used Motorcycles for Sale . In my opinion there is not a better deal on used Hoverround scooters for sale as this in Mesquite TX Texas USA or on Craigslist so if you are interested in the Hoveround Power Chair Scooter for Sale email if you're interested . My price including the leg extenders is just $2800 with full retail price $4800 and even with the discount; my price is negotiable within reason!